Traditional Italian restaurant and food. The food tasted good. Nice selection of dishes on the menu. Service was fast and friendly. Good atmosphere but a bit noisy for my taste. Very good food and a nice looking place. The service could have been warmer. Always friendly service and excellent food. The spaghetti alle vongole were Good but The carbonara was NOT so Nice. Tasty and well-priced pasta. We would've wished the pasta to be "al-dente", but it was ok.
lovely place and nice dishes as always. The atmosphere was fantastic, the service was impeccable and the food was delicious. An authentic Italian restaurant that I without hesitation can recommend! 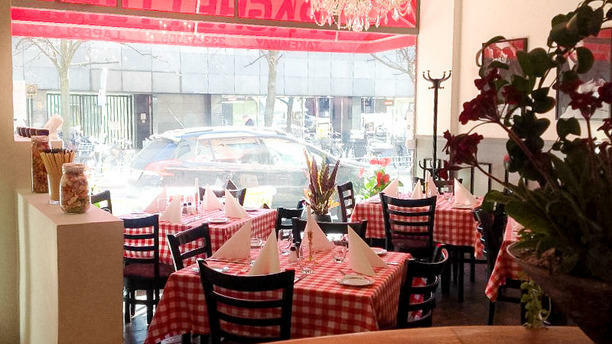 An undistinguished exterior and a standard sort of pizza/pasta Italian restaurant interior. The menu also appears pretty standard. But the food was excellent! The mushroom risotto and tortellini were far better than your average pasta house fare. There are lots of Italian restaurants in the area, but this may well be the best. The food is just Ok. They do not use fresh ingredients and pasta are packaged. The service is also average. Price is Sumilar or slightly lower than other restaurants we visited in Copenhagen. If you want authentic Italian food, this is not the place. Delicious pasta with friendly service. I went with my family and we really enjoyed the food. It was fresh and deliciuos. My kids got lasagna, it was excellent, I got a spicy pasta with shrimp, it was amazing. Great portions. I would definitely come back and recommend La Perla. Nice staff, wish there was a cheaper wine option, yum pizza and carbonara. Had a large party that arrived at two different times and they were nicely accommodating. We enjoyed both our large pizzas and the atmosphere. Service was friendly and efficient. We are just not used to paying for tap water but don't let that put you off going.